Just when I think I know Disney history, something always pops up to prove to me wrong. This happened to me the other day when I was flipping through my copy of Dave Smith’s “Disney A-Z” book and caught a glimpse of a listing for “Fort Wilderness Railroad.” Huh? Although I’ve spent nights at the campground before, cheered along the Hoop-De-Doo Revue and taken my son to see the horses at Tri-Circle-D Ranch, I had no idea the property used to have a functioning train that shuttled guests around the resort’s 700 acres. It turns out that the railroad ran only for a short time, operating from 1973 to 1977. The system featured four stream trains that circulated through the campground on a 3½-mile track. The trains’ cars were themed after “plantation locomotives,” a specific style of open-air cars that shuttled consumables, like sugar cane and pineapples, around Hawaiian islands. Each of the four trains – decorated in forest green, red, and gold colors – measured just under 115 feet and could seat 90 guests. The railroad eventually closed due to a number of operational challenges, including the small size of the trains’ fuel tanks, and track problems due to a high amount of clay in the soil. Cars from the Fort Wilderness Railroad were later repainted and used as funky ticket counters at Downtown Disney. These cars were later sold at a private auction and one of the railroad’s locomotives was donated to a local Central Florida museum. That said, does anyone remember taking a ride? Both times my family went to WDW (79 and 84) when I was a kid we stayed at Fort Wilderness in rented campers (now “cabins”). We would spend a whole day at River Country. I even have a picture I drew when I was 5 of the slides at River Country. Discovery Island was also a favorite of mine, although I didn’t like the ship wreaked pirate ship (I think I thought it was haunted). It is sad to see the two highlights of FW of my youth gone and all but forgotten. I’m glad 2 of the 4 Fort Wilderness Engines are still in Disney related hands in California. One in the Carolside Museum and one in John Lasseter’s own railroad, much like Disney Legends Ollie Johnston and Ward Kimball once had. I was able to be present when Ward fired up his Nevada on Race Day after many years of silence. Hope John will invite me to his opening. Ward said I made a good Brakeman. I wish they still had the railroad, or at least could replicate it somehow! It would be a much neater form of transportation to get throughout the campground(motor coach just isn’t as “campground” in my opinion). Instead of being a way to get out of the campground, it might be a way to experience further the campground. I remember the Rail Road, and the Chip and Dale buses that used to run around the campgrounds. How I hate being woke up by those noisy diesel ones now. I had heard about the 1 Fort Wilderness engine being rerouted to Calfornia to the Carolwood Museum. Sorry we didn’t get one for Thunder Mesa in Paris Disneyland. Good to hear a part of River Country is being utilized in it’s water tower. Would be great if they could re open it. Look how long the submarine ride at Disneyland sat and was finally reopened. Keep an eye on that water wagon Carol and let me know when it comes back! Fort Wilderness is our family’s favorite place to stay at WDW! Our first experience was taking our four daughters to Disney for Christmas and staying in the trailer-style accommodations on the Fort Wilderness grounds. Our girls weren’t sure they wanted to celebrate Christmas away from home (how would Santa find them?) but they soon realized that we were in the best place ever to have a wonderful Christmas together. What memories were created! (and Santa, of course, was able to locate them!) And many years later, We have now added another wonderful memory by having our daughter’s Wedding at the Grand Floridian and gathering again at Fort Wilderness Lodge for the week-long celebration!! Priceless! Congratulations on the wedding. Disney really is the best at Christmastime, isn’t it? That sounds like a great gift. You’re so lucky to have some of those early moments of Disney history (and family fun) on film. I agree that Michael Broggie’s book, “The Walt Disney Railroad Story,” is an excellent look into Disney train history. I highly recommend getting it. Perhaps Amazon or Ebay would have copies. Our first 2 trips to WDW were to camp in Fort Wilderness in the early 70’s, my wife and I the 1st time, with our young daughter the 2nd,and we rode the train frequently both visits. We also bought items from the old pickup truck. Wish they still had that train running as it made our camping much more fun. I don’t remember the railroad, but i very clearly remember River Country. We visited around ’78 or ’79 when i was 9 or 10 years old. River Country was AMAZING! A few years ago my husband and went and peeked in the fence, it was so sad to see the old bones of River Country overgrown with weeds, etc. It would be the biggest thrill if they would re-open River Country! Having said that, my most absolute favorite memory of our stay in Fort Wilderness was something called the “Marshmallow Marsh” where a group of campers boarded canoes and paddled to a campsite (with Goofy or Chip and Dale i think?) and we all sat around the campfire eating marshmallows and singing camp songs. It was the BEST time in Disney. I know now they do the sing along with Chip and Dale in Fort Wilderness, but the canoe ride made it just that much more special. Does anyone else remember the Marshmallow Marsh? I’m sure this was an expensive (and noisy) thing to have at the campground (big ole buses not much better). I wish they had a better mode of transportation around the campground that was efficient and quieter, and less-smelly than the buses. The water wagon was onstage up until a few months ago out front of Pioneer Hall. It was rolled backstage behind Trails End supposedly for refurb where it still sits now. The River Country water tower is now being used as part of the waterslide for the main pool. PS – I really wish there was a place for me to “like” some of the other comments! I remember riding the railroad with my cousins and it was so great because our parents let us loose, yes we behaved ourselves. What fun we had. I went there with my niece and nephews; we the adults wish the train was there for them! The good old days where you could go without your parents and be safe. 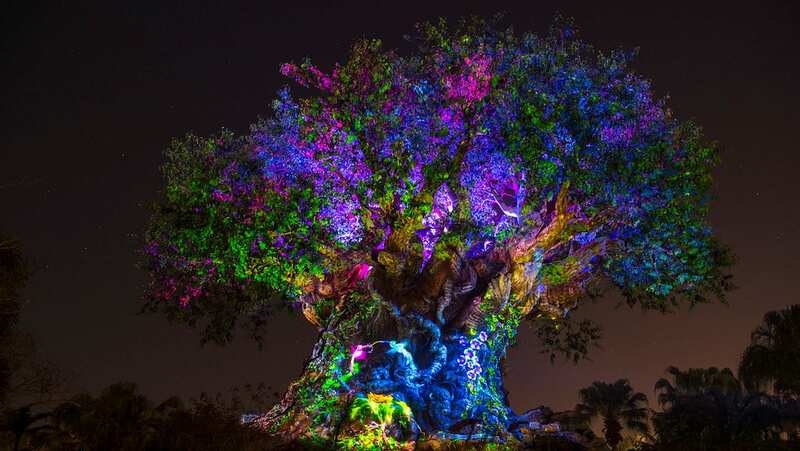 Thanks Disney for all the years of continued FAMILY FUN! I visited FW for the first time when I was 8 (1978) – don’t remember the train – must have stopped by then – but I’m so glad to hear others have the same memories of the MOST incredible River Country, the lakefront beaches (with shady pistachio trees – and nuts!) and the trams (not so fond of the busses used now, either). I also remember “biking” on a floating 3-wheeler throughout the creek, nightly movies (where I fell in love with ‘Aristocats’) and Spanish Moss and Armadillos everywhere! OMG. I LOVED “Aristocats.” I had a plush Marie the movie, which I remember buying at a shop on Main Street – I think I still have it somewhere. This movie started my childhood obsession with having a pet cat someday. Wish it was still there! That would be super cool. I never took a ride on that train, but I have fond memories of riding a miniature train in a man’s HUGE backyard. My dad worked for a newspaper and did a story on this sweet man who built the train for kids to ride, and I was one of the lucky riders. The St. Louis Zoo also has a fun mini-train that I have fond memories of riding. My Boy Scout troop came and stayed at the Fort Wilderness area in ’76 (not my first visit – been coming since Spring Break of ’72!!!). I remember some of us boys that loved trains riding the train before dinner one afternoon. Hate that it ever left!!! What a cool Boy Scout trip! My Girl Scout troop had to go to the real woods, which wasn’t so exciting (for me) after 10 minutes. I was practically raised at Fort Wilderness and the trains are one of the things I really miss. The others are Musket Mickey, the trams (instead of buses) and the Marshmallow Marsh. In 38 years, I have only stayed at one other Disney resort…my favorite is and has always been, Fort Wilderness! We have a local theme park which has an antique steam engine. The story goes that they outbid Disney World to get it! I wonder if that train was meant for FW?! Yes, I remember the railroad. We stayed at Ft. Wilderness during our first trip in WDW in 1973. We took this train every day while there. Love the memories at WDW in the past!! I wonder if the old antique wooden tank waterwagon is still there that we purchased for Fort Wilderness Campground and had the logo painted on the sides of it. The steam trains needed water, and this reinforced the story. We do have one in TDL Big Thunder as well as PDL Thunder Mesa at the Circle D Ranch and 2 being pulled by a “Grand” steam powered 1880’s Minneapolis traction Engine in Rose’s Blacksmith. I did get to drive that at a top speed of 4 MPH and it has a great Walt Disney World story before it went to EDL. No, I wish I had been able to take a ride. I stay at FW several times a year. If you look, you can still find some of the old track remnants. I rode the railroad many times growing up … I miss it. Had a great time growing up in Fort Wilderness! I was lucky to work at WED,and on Pioneer Hall and Fort Wilderness when they were being designed, and River Country followed. I didnt get to Florida until 79, and never got to ride the trains. I did try to purchase an engine for Euro Disneyland’s Thunder Mesa, where a possible Natures Wonderland might have been built. I was told they would be reused but never were. Sad the Rail Road is still not around. The buses and golf carts just kill the atmosphere at Fort Wilderness Camp Ground. The Rail Road fits in nicely. Wish they could come up with a better transportation system that fits in better with the theme! There’s a really fascinating history of these trains (Isn’t there always?) and there are two books I recommend by David Leapart that are absolutely full of pictures. If you get a chance, you may really enjoy seeing more about the trains! 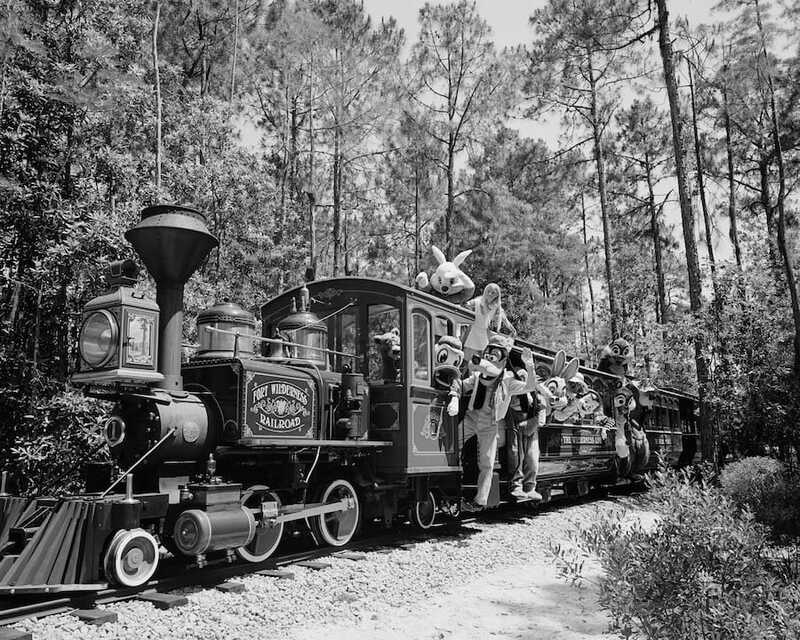 I can remember spending hours riding on the Fort Wilderness Railroad as a teenager. 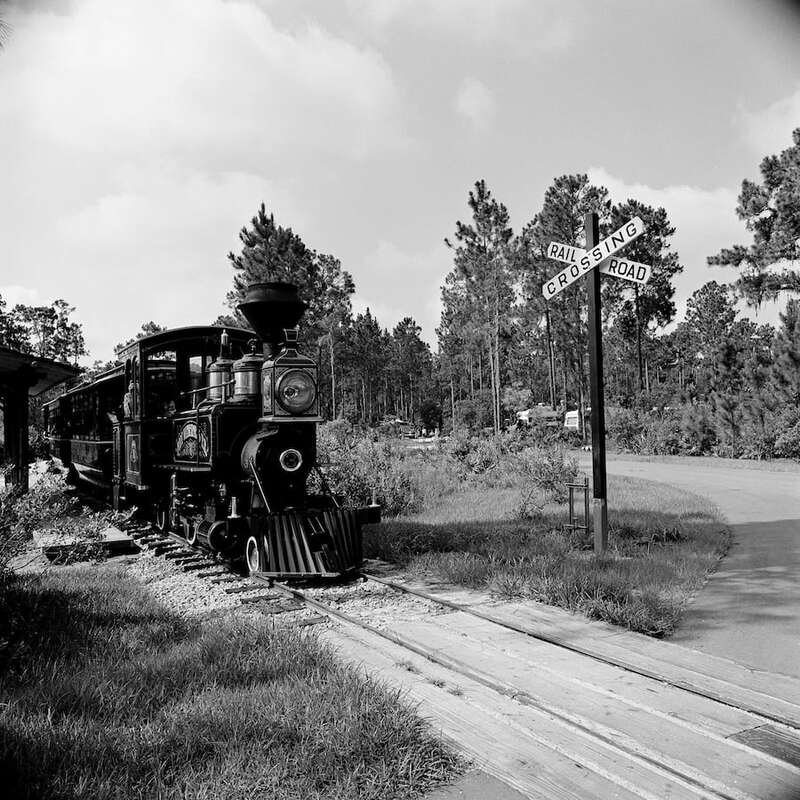 Few people know that the tracks were moved and realigned behind Cinnamon Fern Way and the station moved to the other side of Fort Wilderness Trail. I can remember the train from when we camped in the ’70s. Somewhere I’ve got a train ticket my mother gave me a few years ago. Yes! I rode it a number of times. It was the primary way of getting day guests from the parking area back to River Country. River Country was (and still is) my favorite Disney Water Attraaction! I have a few memories of River Country, as well. It was the most advanced water park I had ever been to (back then!). I stayed at Fort Wilderness (still have my welcome packet) just after I graduated from High School in 1976. We spent a day at River Country (around the corner from the Hoop de doo Revue) and took a ride on the train. The high spot just after the four way stop as you’re entering the campground area (near the 2000 loop)was the backend of the train’s route. I believe Disney donated one of the trains to the zoo in Brevard County (on the East Coast)and is one of it’s attractions. That’s interesting about the Downtown Disney ticket windows…or more accurately Pleasure Island ticket windows. I had no idea that’s where those train cars came from. My wife and I rode the Fort Wilderness Railroad when we camped there during our honeymoon in ’76. I got a couple of pictures. Very cool. Must’ve felt very “wild west” back then.